The museum was founded by Jon Johnston in 1996. Jon was the creator and driving force behind the museum for the next 20 years until his untimely death while mountaineering in Tibet in April 2016. I had my first experience with HP computers at Stanford University in 1980. We used brand new HP-85 computers in thermodynamics lab. A lot of my colleagues also bought HP-41 calculators when they first came out. Wow, talk about an unfair advantage! I could only afford a second hand TI-51. My first real job out of college was with HP in San Diego in 1983 (I had worked as a gemstone cutter during the summers while in college). I was a regional support engineer (factory-based) for parts of the US and Asia Pacific. I got the job through my college dorm mate - Todd Sullivan. He had gotten his job through another dorm mate – Suzanne Tylka. At various stages, we each ended up working for my college fraternity residence assistant – Mick O’Rourke. We all had a terrific time working for HP. The environment was challenging and rewarding; the San Diego Division was very successful (SDD made pen plotters). I moved with HP to Australia in 1989 as the market development manager for the Peripherals Group. This job was also a lot of fun and I worked with a great group of people. I started my own HP integration business in 1992 (Centari Systems) based in Melbourne. Over the next six years, Todd, Mick and Suzanne joined as partners in the business, each managing a different state. Our company became the largest HP commercial dealer in Australia by the end of the 1990s. HP was a great company to do business with. The company treated its business partners as ethically as it treated its customers and employees. I started collecting old HP computers in the mid-1990s. These machines came from my customers who were retiring them. It seemed like such a shame to throw away this old equipment, even though it had no commercial value. I also began acquiring items from HP employees, ex-HP employees and on the internet. We sold our business in 2002, and I began developing the museum. 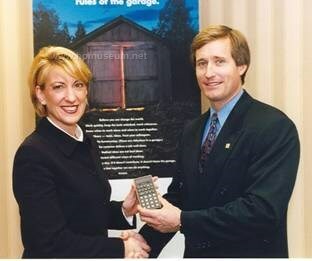 with an HP-25 calculator from the museum (2000). In April 2016, David Collins took over the role of Curator for the HP Computer Museum with the goal of continuing Jon's efforts to collect, preserve and restore HP documentation and vintage computing equipment from 1966 to the mid 1990's. David's first job out of university was with HP Australia in 1982 as a Customer Engineer maintaining HP3000s, HP250s and associated peripherals and terminals. David stayed with HP for over 26 years (including 5 years in Palo Alto) in a range of Engineering and Service Management roles and has many fond memories of the company and the people he worked with over that time.